What you are looking at is the Hotel Le Bleu, as seen yesterday, now revealing itself in all its glory on the Gowanus side of Fourth Avenue. The hotel is slated for a July opening. It's an eight-story boutique hotel with 48 rooms designed by Andres Escobar. 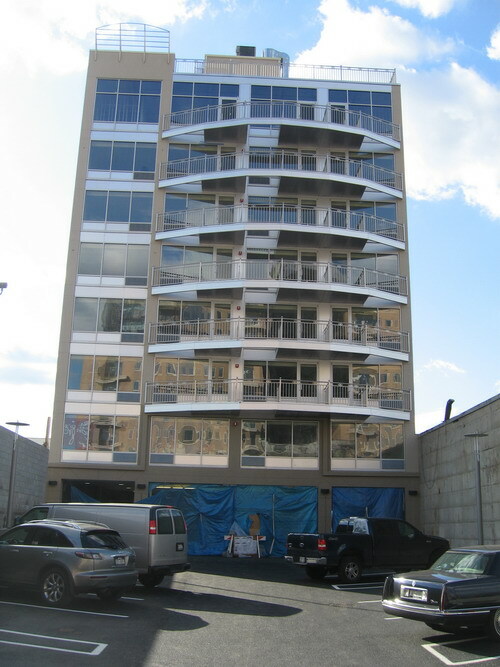 There will be a restaurant, which the Brooklyn Eagle reports will be called "The View" on the eighth floor and, as you can see, there is parking in the canyon-like space out front. There is also apparently going to be a "rooftop lounge," which should provide superb Gowanus panoramas. Among other things, rooms will have glass-walled showers some of which will allow views of Gowanus and beyond while one is taking a shower. “I predict it will become one of New York City’s most acclaimed destinations,” Escobar told the Eagle. Glass walled showers with views of the Gowanus!